Use the cover to hide items stored in the cargo area. The cargo area cover will be lifted when the tailgate is opened. Disconnect the strap (1) from holder if you want to return the cover to original position. 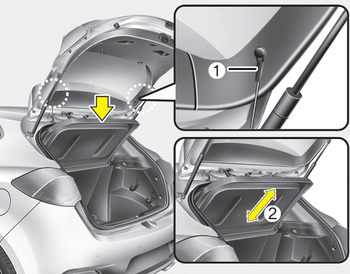 To remove the cargo area cover completely, lift the cover to a 43-degree angle and pull it out to the full (2). For installation of the cover, reverse the removal procedure. When you return the cargo area cover to its original position, hold the cover and lower it. Do not operate the vehicle with the cover removed. It may damage to the cover. The cargo area cover may be lifted when the tailgate is opened. Ensure that the luggage on the cover is moved to a safe place. Since the cargo area cover may be damaged or malformed, do not apply excessive force to the cover or do not put the heavy loads on it. Do not place objects on the cargo area cover while driving. Such objects may be thrown about inside the vehicle and possibly injure vehicle occupants during an accident or when braking. Maintain the balance of the vehicle and locate the weight as far forward as possible.